The Objective Cooling Collar is an isolated fluid and thermal transfer device that attaches to the top of the objective and provides a means of attaching coolant lines from a cold source or chiller bath. The removal of energy from the objective is more difficult and less efficient than heating. Make sure you have enough sub stage room for the additional diameter required for the cooling collar and tubing. Cooling collars are precision machined to fit specific objectives. If you are using high N.A. objectives at below ambient temperatures it will be necessary to cool and thermally isolate the objective from the scope. The optional thermal isolator will prevent condensation from forming on the lower element of the objective. A gas port is provided to purge the adapter with dry nitrogen. 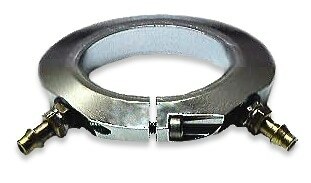 An anti-reflection coated window optimized for 340-700nm seals the bottom of the adapter.